Museum of the Future ... to be powered by an exclusive solar plant. 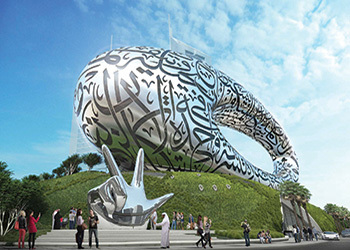 A unique incubator for futuristic innovation and design in Dubai, Museum of the Future is designed to meet Leed (Leadership in Energy and Environmental Design) platinum rating for green building standards. As per the MoU, Dewa will work in an advisory role to provide solar energy technologies, smart grid integration, energy efficiency, water treatment through renewable technologies, artificial intelligence, machine learning programmes in energy, water and related areas, remarked Saeed Mohammed Al Tayer, the managing director and CEO of Dewa after signing the deal with Khalfan Juma Belhoul, CEO of Dubai Future Foundation, in the presence of senior officials. The Dubai utility will also provide various research and development dissemination activities, targeting the academia and industry in these sectors, as well as provide the museum with advanced energy, water technologies and applications. “Through this agreement with Dubai Future Foundation, we are keen to strengthen co-operation between various government entities, to elevate Dubai’s position across all fields,” remarked Al Tayer. “The MoU with Dewa comes in line with Dubai Future Foundation’s eagerness to employ modern technology and strengthen Dubai’s position as a world leader in building the future and serving humanity,” he added.